This is my very first blog post on my new website and I'm very excited. I have been very lucky to be so busy in 2014 with Nourish Through Nature I thought I should return the favour with a nutrient dense sweet treat! Spirulina is a blue-green algae that comes in a powder form. it is a superior source of digestible protein. It contains 12 times the protein of beef! It is a beautiful source of gama-linolenic acid (GLA), a "good" fat necessary for the human brain and proper heart function. It contains large amounts of green chlorophyll which is rich in iron! Chlorophyll closely resembles human blood which is why it is known as a blood cleanser and builder. Spirulina helps detoxify our system by removing heavy metals. I could really go on and on about this wonderful abundant algae! It is a 3.5 billion year old micro algae and if something can survive and adapt to our ever changing planet and feed it's species all the while... I don't know how else to sell this beautiful nutrient-rich superfood! That being said, an algae is and algae and it doesn't have the most familiar taste. In fact anything it's added to it usually overpowers. 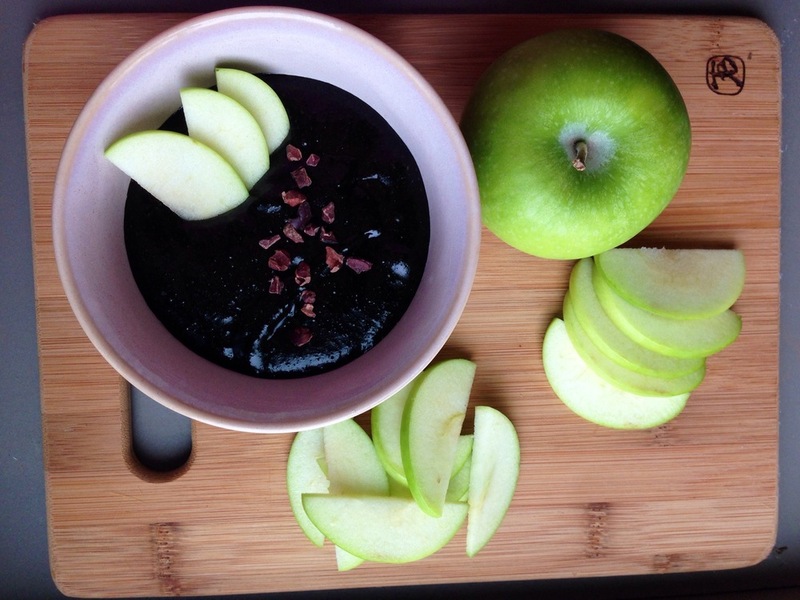 It works wonderfully well with chocolate so I made this dark green chocolate fruit dip. If you are new to spirulina start with a smaller amount and adjust to taste. Feel free to add more if you enjoy the flavour! Mix all ingredients, except cacao nibs, in a bowl using a whisk or a spatula until you have a dark green smooth texture. Serve with your favorite fruit. I picked a local seasonal fruit, apples. Enjoy & Nourish!